Work spaces at home can be elaborately scaled in a separate room, or they can easily integrate into other areas. 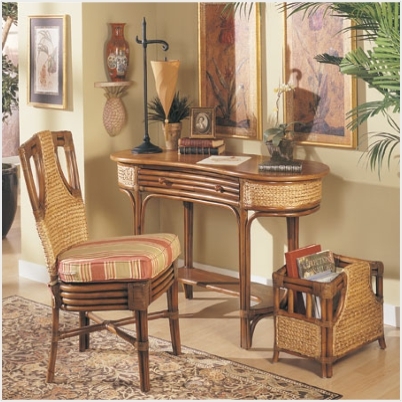 With wicker furnishings, it makes sense to bring a desk and accessories into bedrooms, living areas and even foyers. 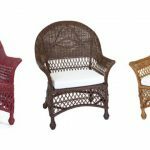 Rattan in cane or woven form is a sturdy and functional choice, and it deserves to receive a little limelight rather than being tucked away in a dark corner. 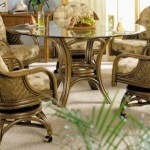 Finishes, sizes and styles will dictate how to fit these pieces in with existing decor. Writing desks are making a comeback as workable pieces that fit smaller areas and meet the needs of busy lifestyles. Whether used as laptop space or for hobbies, they resemble console tables while retaining their office practicalities. Ensembles with matching chairs create unity when tucked in a corner of a living room, but they can also serve useful purposes in a foyer. Secretary desks are another option that will become a timeless attraction for open areas. They offer a traditional profile with their drop-down fronts while keeping everything tidily tucked away. Blended media choices include wood cabinetry with accenting from matched rattan weave panels. 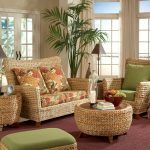 If closet space is unavailable to store supplies, wicker towers reduce the footprint while creating a fresh update in drab rooms. Taller, narrow stands with open shelves above and base storage featuring door access provide a nice balance between display space and clutter reduction. 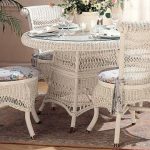 White, natural and pastel colored wicker units can easily blend into country and cottage decor while darker finishes add appeal in lodge and Americana settings. 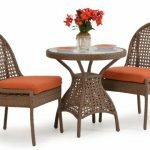 Urbanites may also find that bringing classic wicker pieces into modernized spaces is an innovative design choice. For many individuals, a separate office area is the best solution. Large or small desks will be central to any work space, along with all the convenience pieces needed for peripheral equipment and supplies. Bookshelves and file cabinets in wicker and wood can project a professional look while retaining the comforts of a home base. 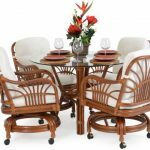 On the other hand, this space can also turn into a tropical setting with cane rattan accessories that make it a joy to head to the office. Enclosed library cabinets are classic in style and are spacious pieces that protect books, manuals and other documents from dust. Adding taller cabinetry also provides extra layers of insulation to keep out noise. Light and bright pieces project a feminized setting, and they work well in hobby areas or craft corners. 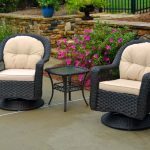 They can also serve double-duty in spare bedrooms along with a smaller desk. Darker finishes may appeal to masculine tastes with decorating choices ranging from lodge and rustic to sports themes. While some living spaces may have to serve double duty as work areas, they can still be organized for efficiency while blending together. Think about adding alternative storage accessories that will not look quite so functional. Choose a bookshelf and fill it with smaller wicker baskets to keep work items concealed. 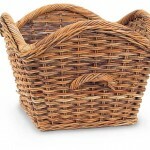 Stacking baskets are another option that can take the place of file cabinets. 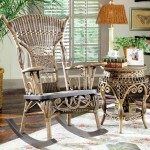 Wicker benches with storage bases and hinged lids are always handy as extra seating. Trunks add a little nostalgia with sizes that are stack able and even portable. 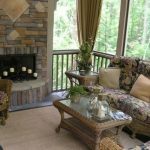 Tropical, traditional, casual or cottage, the list is nearly endless in how to turn home areas into inviting work spaces. 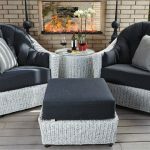 Wicker furnishings and accessories can adapt to almost any setting while providing the functionality needed to complete everyday business tasks.